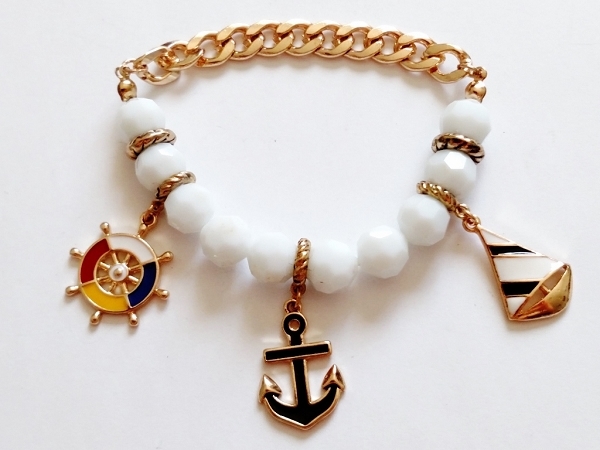 White/Gold Tone, Gorgeous Naval Nautical Bracelet with Anchor, Wheel, and Ship Charms. Express your love to Sailing. Here is a White/Gold Tone, Gorgeous Naval Nautical Bracelet with Anchor, Wheel, and Ship Charms. Feels nice and firm. The Bracelet beautifully crafted from Metal Chain and Blue Beads on a stretching string. Anti-allergic Jewelry, Lead and Nickel free.